The boundaries between work and leisure are totally disintegrating. A visit to one of India’s largest co-working spaces, The Hive, in Whitefield, Bengaluru, shows this. This massive integrated collaborative workspace is set inside a mall (VR Bengaluru) with access to a hotel, a fitness centre, a swimming pool, a jogging track, a cinema theatre, restaurants and food courts. Vidushi Jain, Deputy General Marketing, Virtuous Retail (the real estate firm that runs the The Hive), is a living example of how this space can be used. For the last one year she has been residing at a studio residence at The Waverley, the hotel within the mall with direct access to The Hive, which is open 24/7. She just walks across a corridor to get to her workdesk. In the day, she takes breaks from work to shop at the mall, use the fitness centre, or simply enjoy a coffee at any of the cafes around. She often pops into The Hive at night to work, ordering dinner through the FoodBox app. Does’nt she miss staying at home? The convenience and comfort I get here is incredible, she says. Co-working spaces are not new in India -but what’s new is the explosion and evolution taking place in the area. According to JLL India, 2016-17 has seen a massive spike in the growth of the co-working industry, and it’s going to evolve further, with occupancies in many centres touching 100 per cent. 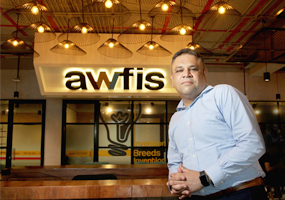 Sumit Lakhani, Chief Marketing Officer of Awfis Space Solutions, one of the largest operators in the country, is pretty gungho about growth, too. He says at present the shared office segment (this includes business centres, too) is just 1 per cent of commercial real estate in India. “We believe this will grow to nearly 5-7 per cent of commercial real estate by 2020”, he says. Along with the big growth, here are some clear trends shaping these flexible, collaborative offices. 100.000 sq ft, it was for a short while the largest co-working space in India. But then global player WeWork entered India, and grabbed the honours with a l.4-lakh sq ft workspace in Bengaluru, following it up with a 1.9-lakh sq feet area in Bandra Kurla in Mumbai. And if you think that’s big, now there’s GoWork in Guru gram at 8-lakh sq feet and over 12,000 seats. But we have not seen anything yet. According to a JLL-WeWork report, The CoWorking Revolution, these alternative work spaces are set to grow by 40-50 per cent to reach over l-million sq ft by the end of the year. And co-working is expected to get $400 million in investments by 2018. The Hive for instance, Airbus is an occupant. 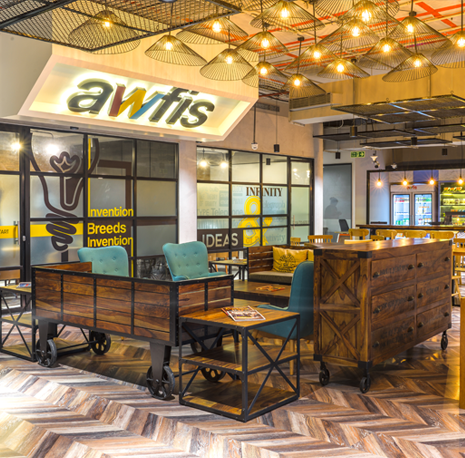 At Awfis, which talks of opening 100 centres with 35,000 seats in the next 15 months, the portfolio of users, according to Lakhani, is â€œ50 per cent SMEs, 25 per cent corporate and remaining are start-ups, entrepreneurs, mompreneurs and independent workforces. With conventional officer users converting to spaces like Awfis, Lakhani believes this is just the starting point of the shared office industry. 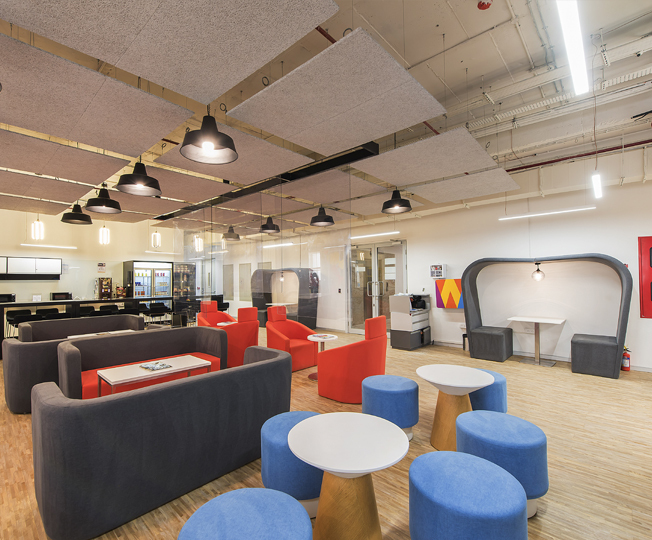 The average age of occupants of these highly social workspaces is also moving up. At The Hive, its CEO Ankit Samdariya says that people of diverse ages are coming in. I would say the range is from 20-50 years old,” he says. At Awfis, the average is 30 across all centres, says Lalwani. The millennial thought process is getting accepted across all generations. And this is clearly getting reflected in our client portfolio as well,” he says. As the industry progresses, trend watchers forecast co-working spaces with on-site suites to stay in will pick up. In Asia, quite a few coworking spaces such as 47 East offer this. Years ago, in Delhi, a small player like Moonlighting had tried it offering rooms to stay for outstation users. But now the trend is going to firm up. Along with stay options, operators are also offering a variety of social action. The Hive, in fact, is selling this proposition heavily. It’s so easy for a member to move from his workspace at 6 pm to the rooftop bar area and carry the team meeting there. Over weekends we get many of our members coming in with their families – while the family shops and watches movies, they get their work done, says Samdariya. Co-working is currently a very fragmented space in India. The JLL report notes that there are about 300 co-working operators in the country operating around 1,000 centres. And less than 100 are branded spaces. Lakhani believes there are more than 500-plus players. But barring 6-7 players, rest everyone is operating at less than two centres and are more unorganised,” he says. The advantage with chains is that users when travelling can avail centres in other cities. For instance, if you have an Awfis or InnovS card in Delhi, you could use it in Mumbai, too. This is a winning proposition for the user and the reason the big players are expanding rapidly. Samdariya says a second Hive is coming up in Anna Nagar, Chennai. It will also be housed in a mall-VR Chennai – and have a mix of facilities from fitness centres, cinema and shopping. The company has plans to set up more such centres across Bengaluru, Mumbai, Pune, Chennai, Delhi and Hyderabad. As these co-working spaces grow big, is the warm cosy friendliness going to be replaced by the impersonality of large offices? The operators are quick to point that the very design of these spaces, however large, will encourage collaboration and meetings. At Awfis, the aim is to design and provide a space that is vibrant and minimal, at the same time a well-defined collaboration area with interesting furniture, flexible settings for events, enclosed spaces with good acoustics, flexible meeting areas that can be easily reconfigured, says Lakhani. Samdariya says there has been a lot of art and science and curation put into the designs at The Hive. “They provide natural light, greenery, are vibrant, open and inspiring”, he says. Also, even if there are 800 to 10,000 occupants, there is a huge community building effort put in by the operators. Many co-working spaces have apps to connect members, encourage networking over knowledge seminars, events like jazz nights, sufi evenings, food experiences and so on. One thing is for sure – they have totally changed the way we work.